Visiting Krakow in Poland, can of the most entertaining and thought-provoking experiences of your life. The area’s history is a mixture of majestic and tragic, which makes the itinerary very unique. 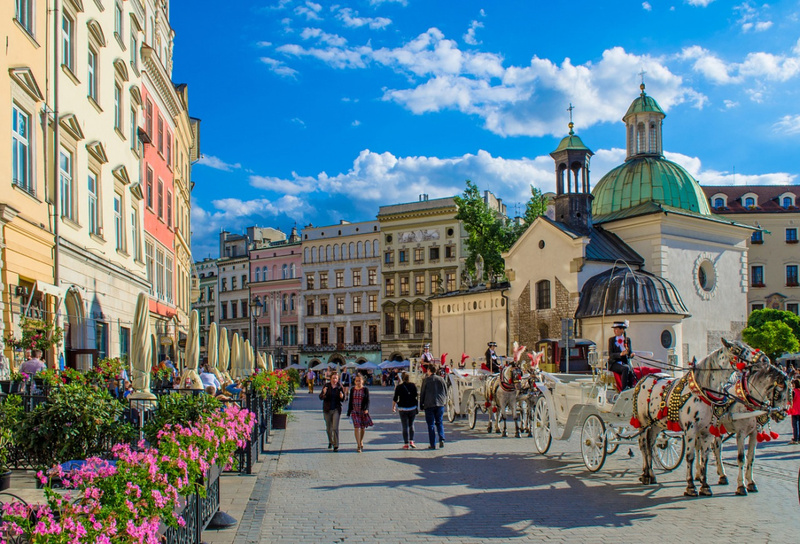 I’ve wandered the globe and looked at some of history’s most interesting artifacts, but no place on earth like Krakow from a historical significance point of view. Of course, Krakow also has plenty to offer to visitors who don’t want to take a walk through the darker side of humanity. The good news is that travelers of all types can easily find the right itinerary inside this city to suit their personal tastes. Anyone of Polish descent should definitely head to the Wawel Castle and Cathedral. For the rest of us, this is also a magnificent spot that’s filled with awe-inspiring architecture and artwork. As odd as it might seem, one of the highlights of this tour is taking a close look at the giant bell of Zygmunt. It’s the largest of the five bells hanging in the tower and weights 12.600 kg (27.77825 lbs). Believe me, I understand where you’re coming from if that gives you a chuckle because many initially fell the same way. But after seeing it with my own two eyes, I can attest to the unexpectedly powerful draw of this ancient object. As an added bonus, anyone who climbs to the top of the bell tower can get an amazing view of the entire city. 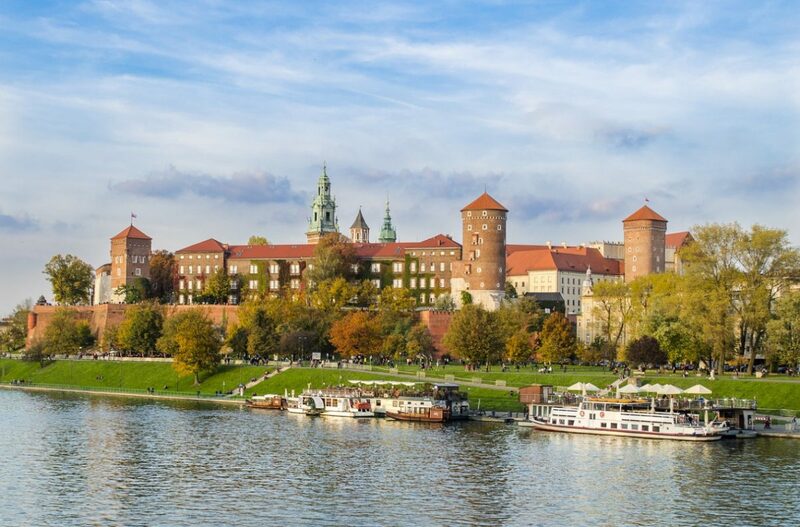 Wawel Castle and Cathedral are also great for travelers on a budget. Although I ended up paying for an audio guide, you can visit much of this attraction for free. The guided tour of the Wawel Cathedral itself takes slightly less than half an hour. However, the budget-friendly aspects of this site also attract a huge crowd. You will probably have to deal with lots of noise and people, which may be a deal-breaker for introverted travelers. The crowd does start to thin out as sunset arrives, so keep this in mind if you’re content with just exploring the exterior grounds. Going to Krakow without seeing Main Market Square would be like going to Paris without seeing an Eiffel Tower. It’s also ont UNESCO’s World Heritage List. This 10-acre square from the 13th century is the premier tourist attraction, which is fantastic because you can walk around it for free! I’ve been to many other main squares throughout Europe, and Krakow’s Main Market Square definitely lives up to its reputation as the largest and most interesting of those that date back to medieval times. It’s surrounded by beautiful historic townhouses called kamienice – traditional Polish tenement blocks. Unlike many other main squares, this one actually still hosts markets, often of them is permanent inside Sukiennice – Cloth Hall. The best piece of advice I can give to Krakow travelers who want to see a top-notch market is to go during the holiday season. Krakow’s Christmas markets are full of decor, intriguing shops and stalls, mulled wines and horse-drawn carriage rides. I did most of my holiday shopping here last year, and everyone was thrilled with their gifts, including myself! I particularly recommend picking some amber jewelry, as well as stopping by Calik for Christmas ornaments as they’re very original and detailed. Fun Fact: Passing through the middle of the Cloth Hall (going from Szewska Street to the Mickiewicz Monument) on one of the walls, at the entrance, there is a knife. The knife was supposedly hung there to warn people and remind them of the law in force. According to Magdeburg Law, the punishment for the theft was to cut off the ears. To start your food tour, there’s a great Polish restaurant right next to the Wawel Castle called Pod Wawelem. Sure, this spot is catered to tourists, but I ate there twice and it didn’t disappoint (and I’m Polish so I know how to judge Polish food). You can try some traditional Polish kielbasas, cabbages, schnitzels, as well as well-know pierogi or potato pancakes. Pierogi enthusiasts might enjoy a restaurant called Pod Aniolami and its gorgeous decorations. The entrance is a little unusual, as it’s an underground place, but it has a great atmosphere. You can try some of their own lard with homemade bread, as well as a lovely range of Polish dishes including starters, soup, wild meats and desserts. If you want to give some street food a try, check out a spot called Kiełbaski z niebieskiej nyski, located in Hala Targowa. This place appeared in a popular Polish movie and since then every day after 8pm you can queue to get a grilled kielbasa with a bottle of lemonade. Don’t leave Krakow without purchasing a bagel – obwarzanek from a street vendor along with some smoked oscypek sheep cheese. Obwarzanek is a braided ring-shaped bread that is boiled and sprinkled with salt, poppy seeds, or sesame. You should just eat it on its own, as it’s chewy inside and harder on the outside. I’ve always been drawn to underground places. Also referred to as the Old Market Underground, this memorable portion of my trip is a dream come true for archeology buffs who are comfortable walking beneath all of Krakow’s other tourists and residents. As you might have guessed from this museum’s alternate name, the Krakow Historical Museum is located directly beneath the Main Market Square. Once you get inside, you pass through the steam curtain, which allows you to feel a bit like entering a medieval city. You can also see the underground part of the old Cloth Hall. You’ll be greeted by ancient remains of Krakow that have been unearthed by archaeologists, including a perfect reconstruction of a workshop from the 12th century, remnants from several burned settlements dating back as far as the 11th century, aqueducts and a map of ancient trade routes. This space is almost 65,000 square feet, so it has plenty of room for lots of tourists. The good news for anyone who wants to get away from the masses is that this museum is less likely than the surface ones to pull in a major crowd. While to foreigners this spot might be known mostly thanks to Steven Spielberg’s movie Shindler’s List, the factor of Oscar Shindler is a real place that you can visit. The factory in which the sheet metal and enamel products were made was established in 1937. Oskar Schindler, an entrepreneur from Germany took over it two years after the opening and called it a German Enamelware Factory. When the WWII started Schindler collected information for the Nazi intelligence service while secretly saving Jewish lives by employing them in the factories that he acquired, later inscribed on the Schindler’s list and survivors of the extermination. The factory was put into use in the Museum in 2007. Both the permanent exhibition of the Factory and temporary exhibitions are devoted to the period of occupation of Cracow by the Germans (1939 – 1945). In addition to exhibits documenting the lives of residents during World War II, you can find there those that “talk” about the fate of the Krakow’s Jews or objects related to the life of Oskar Schindler himself. Once known as the Jewish District, this historical neighborhood has become one of the hippest places in Krakow. While Kazimierz is no longer officially known as the Jewish District, but there are plentiful synagogues and Jewish restaurants. I always find lots of great vintage shops here. I also enjoy delicious vegetarian food from some of the numerous local restaurants. The Jewish history and historical buildings in this area would be intriguing enough on their own, but I was really pulled in by the street art. Anyone who enjoys art will want to be sure to bring their camera, along with an empty memory card. Additionally, the artesian shops cannot be beaten in terms of finding truly unique and beautiful items. Another nice touch is the addition of a circular market. It’s not nearly as big or packed full of people as Main Market Square, but that’s one of the things that I loved the most. Don’t take this the wrong way; there are a lot of tourists who wander through this area. Still, those who want to steer clear of massive crowds will likely feel more at home in Kazimierz than the Main Market Square. Krakow Pinball Museum is one of my favorite tourist attractions. For only $10, you’ll gain entrance to the museum for an entire day, including in-and-out privileges. If you’re a video game enthusiast or have children in your group, this is a must-see spot that will alter your definition of a museum. The exhibit is completely interactive, which means that you can play as many games as you’d like without spending any extra money. Yes, that’s right; unlimited gameplay is yours with admission! I spent hours here trying each of the more than 60 pinball games. Despite this impressive selection, I got the most enjoyment out of playing my favorite arcade game, Galaga. This museum has approximately 25 other classic arcade games, ranging from Pac-Man to Mortal Kombat. You can visit this spot the day after visiting some of the ‘heavier’ attractions to change of pace to boost your mood. Or in case of rain. Billed as an interactive museum dedicated to fear, Lost Souls Alley is basically a big haunted attraction that has been strongly influenced by horror movies. If you think this wouldn’t be a big priority for travelers, then get prepared for a shock. Lost Souls Alley is one of the hardest tickets to get, and it’s also ranked as one of the best attractions in Krakow by TripAdvisor. Fortunately, you can reserve tickets for Lost Souls Alley in advance. There are three different fear levels to choose from: Easy, Medium and Hard. Easy is recommended for groups with members between the ages of 14 and 18. I chose Hard, and the scares were comparable with some of the biggest, most lavish haunted attractions in the world. One thing that really sets this attraction apart from similar businesses in other big towns is the cast’s dedication to giving people a truly scary adventure. I also really loved getting to solve puzzles along the way. In many ways, it felt like being inside a horror movie; but for once, no one had to worry about somehow being killed by a monster who never runs. I’m a big kid at heart and have fond memories of putting together LEGO sets during childhood. Therefore, I couldn’t resist the allure of HistoryLand, and I suggest that you don’t, either. It doesn’t matter if you have kids with you or not. HistoryLand is a good way to learn about Poland’s history in a very fun format: LEGOs! Located outside of the main shopping center of Krakow, this attraction uses thousands of colorful LEGOs to showcase Krakow’s history. Buildings and important moments have been painstakingly recreated, including a scene with turbulent water. Each set has electricity, which makes these buildings seem real. Kids and others who enjoy LEGOs also have the ability to make some of their own creations inside of HistoryLand. There are stunning backdrops for the pre-built sets, and you can even put on a virtual reality headset to see things in a completely new way. After visiting this attraction, I must admit that I wish every museum had a LEGO section. It would certainly make it easier to get kids, and some adults, interested in history. Don’t expect to bring any impressive sets home for yourself unless you have thousands of dollars to spare; unbuilt LEGO sets for everything from historical buildings to Star Destroyers from Star Wars can cost as much as $4,500. As cool as these sets are, they’re definitely outside of my budget. Planty Park is a lovely spot that I visited a few times. Not only does it serve as a great shortcut to some of the city’s other attractions but it’s also a nice place to relax. The park consists of a well-groomed pathway that encircles a lot of green space and some eye-catching attractions, including photo-worthy statues. I was intrigued to learn that the green space was once a moat that helped guard the Old City’s walls. 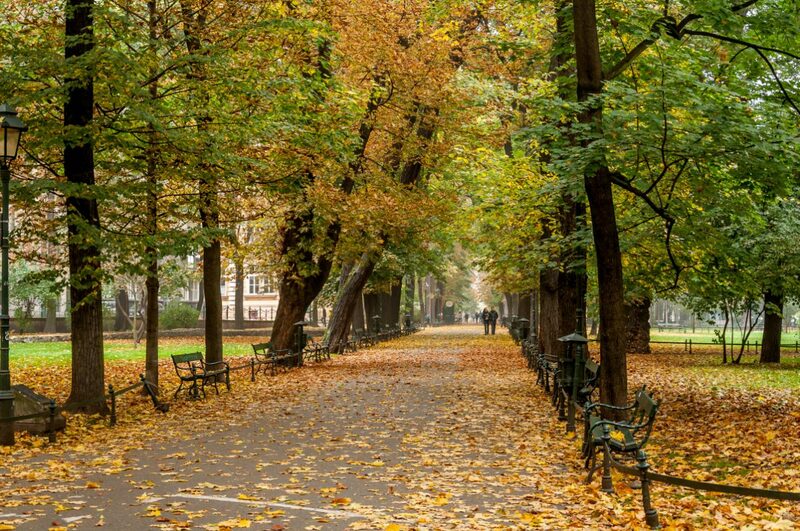 Instead of being a defensive measure, it’s now one of the most relaxing places to walk or have a picnic in all of Krakow. The entire path can take strolling travelers approximately an hour to walk, but you can also cut across the lawn if you need to be somewhere else more quickly. I loved all the old trees, and the plentiful opportunities to sit back and contemplate life as other tourists and locals walked by. Anyone who wants to have a picnic in Krakow, or even those who just need to get off of their feet for a while, would be well-served by a visit to Planty Park. A place that only a few people know about and is very unusual. Located in Podgorze district there are colorful stairs with various interesting quotes written on them. I do not have to add anything else – just look at the pictures. These staircases were a part of an exhibition. Their creators thought that nowadays people are so busy that they lack the time for both smile and reflection, and these rainbow stairs are supposed to change this state of affairs. A green place with a beautiful view. There are four mounds in Krakow, but I think that Krakus Mound (Kopiec Krakusa) is the most pleasant. It is quite easy to get there and you can combine this trip with exploring Podgorze district with colorful staircases. Next to another attraction – Lebanon quarry. There used to be many inconspicuous chapels in Krakow which we often pass by, not even realizing how old they are and what functions they once performed. The stories of these lighthouses belong to the kind of curiosities I like the most. The Lighthouses of the Dead were small buildings in which the lamp was placed to warn people that death was present in the area, such as cemeteries or hospitals. They informed that a given place is not friendly for the living, so it’s not worth to go there. For example, they warned about the possibility of catching something and illuminated the darkness. Next to St Nicolas Church at Kopernik Street – XVIth century one that used to stand near a hospital for lepers. Saint Sebastian Street – XVIth century one that used to stand near a hospital for venereal. Quite an interesting spot, not only for chemists and pharmacologists. It’s a quirky and interesting place to visit in the center of the Old Town. It’s a convincing, moving and interactive demonstration that fully reflects the life and atrocities encountered by Jewish residents of Krakow in the ghetto. Nowa Huta is a city built from scratch according to a specific plan. Looking at this district from a bird’s eye view, you can see the non-random arrangement of streets and housing estates. In my opinion, this is a small urban masterpiece. Much is said about bunkers in the areas of Nowa Huta from the time of the Cold War and some claims that most building are shelters that were to be connected to each other, creating an almost underground city. However, the truth is probably not as spectacular, but still – very interesting. The town had never had sufficient financial resources for the construction of properly working atomic shelters. According to the reports from the 1970s, the shelters were already in a bad technical condition, some of them were not completed, and there was no equipment either. In short: today they would not be able to perform their functions. However, you can visit some of the shelters anyways. Although Auschwitz is technically outside of Krakow, many of the tours to this site originate from the city. It takes an average of six to eight hours to complete this trip, including the tour, which means that you’ll want to dedicate a full day to it. I’m not sure that the right combination of words exists to express what it’s like to visit one of the darkest spots in human history. 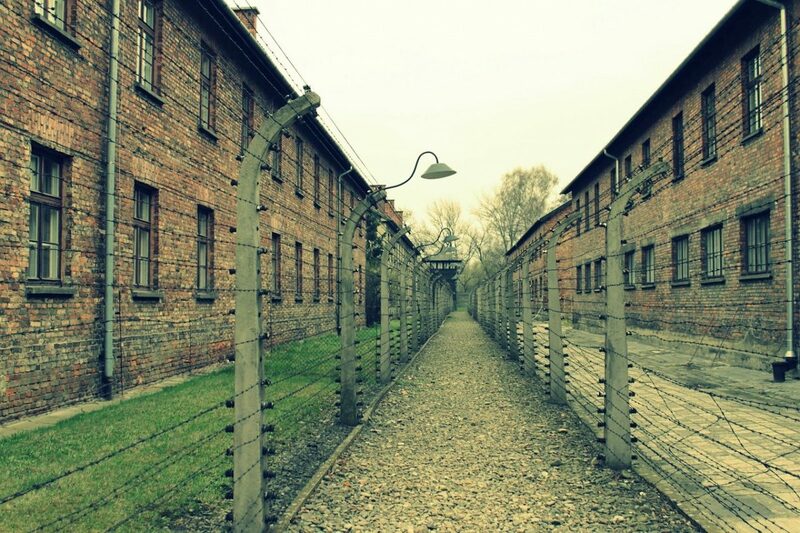 Those who want to have a purely fun trip may be better served by skipping Auschwitz, but it would be a shame to miss out an area that contains so much of Poland’s history. It goes without saying that this former concentration camp from WWII housed atrocities that many people cannot even fathom. An estimated 1.1 million people died at Auschwitz, and that’s an emotionally heavyweight that many have reported feeling when they walked through the gates. I was forever changed by this somber experience, and I definitely recommend it to history buffs, people of Jewish descent and anyone else who wants to get a better understanding of the worst aspects of human nature. Visiting Auschwitz is also a good way to honor the lives of those who were lost in concentration camps. 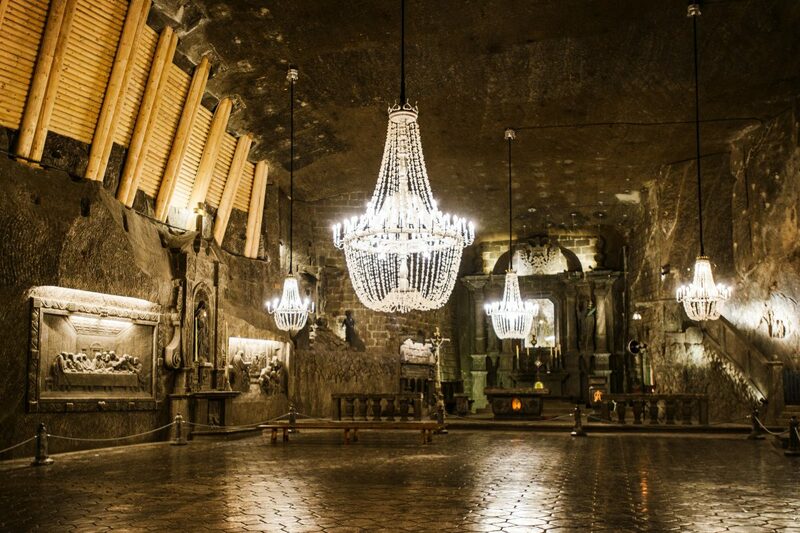 Wieliczka is a salt mine, which has been active continuously since the 13th century. In the 1970s, the building was inscribed on the UNESCO list of World Cultural and Natural Heritage. While only part of the mine is available to the tourists, and the 3.5-km section is exactly located at a depth of 64 to 135 m, while in the mine there are a total of 300 km of pavements, located on nine levels, reaching a depth of 327 m.
There are many ways of visiting this salt mine. The most popular tourist trail leads through chambers carved into salt, underground lakes, and salt sculptures. The mining trail shows what the miners’ work looked like. People deciding on his passage receive equipment consisting of a work outfit (protective suit), a helmet and a lamp. Equipped, they descend the oldest mining shaft existing in Wieliczka – Regis, to feel down below how everyday underground life looks like. Realism is added by granting each profession a mining profession and tasks to be carried out underground. You can also choose a pilgrimage route, culminating in the chapel of St. Kinga with magnificent altars carved in salt, and a carved pulpit or a copy of Leonardo da Vinci’s Last Supper. You could also get married there if you wish, and prebook the event. 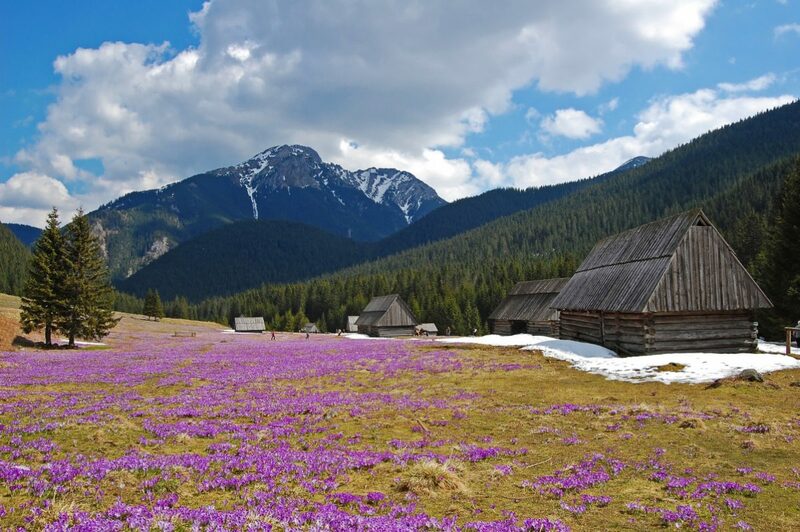 Zakopane is a city located at the foot of the Tatra Mountains, with breathtaking views and picturesque and natural landscapes. The architecture there is stunning as the vast majority of buildings are made entirely out of wood. While I do recommend staying overnight, if you just have a day you’ll be able to see mountaineers’ cottages, try some oscypek cheese, and ride a funicular all the way up to Mount Gubalowka. Alternatively, you could take a hike to Morskie Oko, a lake located between the mountains that looks beautiful in both summer and winter. It reminds many people of the Instagram-famous Lago di Braises in Italy. When you’re done with your short hike you can climb to neighboring mountains such as Giewont. If you’re visiting in the winter you can do some skiing as there are many slopes around, with the most popular being from the top of Kasprowy Wierch. In the spring or early summer, you could see blooming crocus flowers. Head to Dolina Chocholowska to see them. Krakow, Poland, is one of my favorite cities in Poland (and I’m originally from Warsaw which is still a rival city). It has the perfect blend of history, tradition, and modernism to appeal to almost anyone. 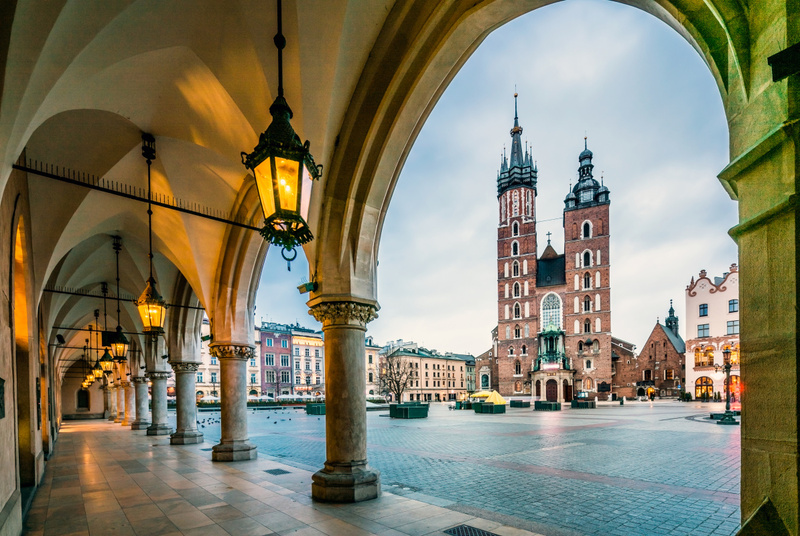 With attractions ranging from tour access to Wieliczka all the way to the Krakow Pinball Museum, it’s no wonder that almost 13 million people visited the city in 2017 alone. Hello there, Anna! This is a lovely list you’ve compiled. Poland is really stunning in all its glory! I had a chance to visit before but I feel like I need to see more of it.